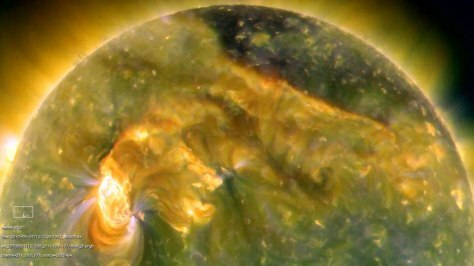 On Aug. 1, almost the entire Earth-facing side of the sun erupted in a tumult of activity. There was a C3-class solar flare, a solar tsunami, multiple filaments of magnetism lifting off the stellar surface, large-scale shaking of the solar corona, radio bursts, a coronal mass ejection and more. This extreme ultraviolet snapshot from the Solar Dynamics Observatory shows the sun's northern hemisphere in mid-eruption. Different colors in the image represent different gas temperatures.